Commercial propagation of marine ornamentals is not an easy task and is complicated by biological and economical constraints. Many species have not been cultured because of their complex reproductive biology; others can only be raised on an experimental scale; and for those that can be raised in large numbers, production is often not cost-effective. Less than 7% of the more than 2,000 traded marine aquarium fish species are farmed at any one time. Experimentation to determine the correct nutritional and environmental conditions to complete the life cycle in captivity. Developing a reliable method so that larger-scale production becomes possible. Making the method cost-effective so that production becomes economical. In 2001, I founded Reef Culture Technologies (RCT) to develop culture techniques for pygmy angelfishes. RCT produced a number of rare, high-value pygmy angelfish species for the aquarium hobby between 2002 and 2011. Culture successes followed with triggerfish in 2010, anthias and butterflyfish in 2013, wrasses in 2015 and surgeonfish in 2018. Most reef fishes are not aquacultured because of their long and complicated larval phase. I started the Hawaii Larval Fish Project (HLFP) to find more aquarium fish species with aquaculture potential. The HLFP primarily uses eggs collected from the ocean, which allows me to work on the larval rearing of more species without having to spawn them at my hatchery. The project also documents the fascinating and rarely shown development of live marine fish larvae from egg to juvenile. Fifty-four species from 26 families have been reared through settlement for the project thus far, including many aquarium species. Baensch, F. 2016. The long road to breeding butterflyfishes. CORAL 13 (3): 46–59. PDF available upon request. Baensch, F. 2014. The Hawaii Larval Fish Project. CORAL 11 (2): 64–77. PDF available upon request. Baensch, F. 2012. The trials and tribulations of culturing the Crosshatch triggerfish and the discovery of a potential first-food organism for small-mouthed reef fish larvae. CORAL 9 (2): 41–55. PDF available upon request. Baensch F. U. and Tamaru, C. S. (2009b). Captive hybridization of two geographically isolated pygmy angelfish species, Centropyge fisheri and Centropyge resplendens. Journal of Fish Biology (2009) 75, 2571–2584. PDF available upon request. Baensch, F. & Tamaru, C. S (2009a). 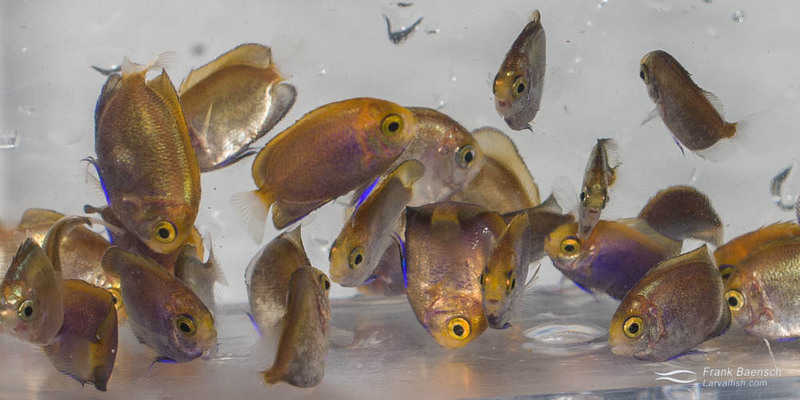 Spawning and development of larvae and juveniles of the rare blue Mauritius Angelfish, Centropyge debelius, in the Hatchery. Journal of the World Aquaculture Society. 40, 425–439. PDF available upon request. Frank Baensch. 2004. Herzogfische der Gattung Centropyge. Die Nachtzucht ist gelungen! In: Nachzuchten für das Korallenriff- Aquarium. p. 181-207. Dieter Brockman. Birgit Schmettkamp Verlag. Baensch, F. 2003. Marine copepods and the culture of two new pygmy angelfish species. Freshwater and Marine Aquarium Magazine 26, 156–162. Baensch, F. 2002. The culture and larval development of three pygmy angelfish species. Freshwater and Marine Aquarium Magazine 25, 4–12. Baensch, F. 1996. The Reproductive Biology of the Pygmy Angelfishes (Genus: Centropyge) and their Spawning in Captivity. Thesis. The University of Hawaii, xv+44 pp.